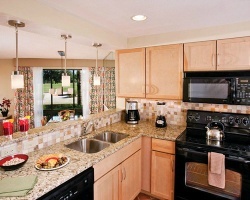 Discover the magic of Orlando vacations year after year with a timeshare at Marriott's Sabal Palms resort. Find timeshare resales and rentals priced up to 70% lower than retail today. Located in the heart of Orlando, Marriott's Sabal Palms provides a unique vacation experience in one of America's best destinations. With a convenient proximity to Orlando's best attractions, like Walt Disney World, Universal Studios, and SeaWorld, this highly-rated resort provides the best in on-site amenities and services. From the sprawling outdoor swimming pool to the full-service fitness center, you'll have everything you need to create a spectacular Florida getaway from your first night at the resort to your last. The two bedroom villas at the Sabal Palms Orlando are perfect for families, offering space for up to six people to stay comfortably. Equipped with modern furnishings and up-to-date entertainment systems, your luxurious villa will provide the perfect home base for your Orlando adventures. With in-unit amenities like private balconies, full kitchens, and a washer and dryer in every unit, you'll have the perfect homelike accommodations to fully enjoy your vacation. If you're ready to secure your very own spot at the Marriott Sabal Palms resort, you can get started today. FIll out the form on this page to learn more about exclusive ownership options at the resort, or call a representative at 1-877-815-4227. Buying a Marriott Sabal Palms timeshare can provide you with years of amazing, guaranteed vacation solutions filled with special perks and amenities. However, buying that timeshare on the resale market can give you all that and more for a fraction of the price. 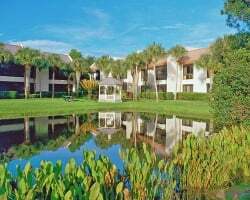 Timeshare resales at the Marriott Sabal Palms resort are offered for sale by current timeshare owners, and not the resort itself. This gives you the opportunity of a lifetime—to purchase your very own vacation ownership accommodations at the resort for prices up to 70% lower than retail costs. Resales at the resort come in the form of deeded fixed and floating weeks, providing a variety of different ownership intervals for you to consider. You can also narrow results by price point, unit size, and more to find the accommodations that work perfectly for you. 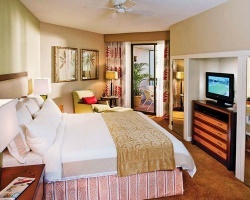 Timeshares at the Sabal Palms fall within Marriott's Blue, White, Pink, and Red seasons. Your timeshare resale could also lead to greater vacation potential within the Marriott Vacation Club. Many timeshare brands levy harsh restrictions on resale buyers, but that isn't the case with Marriott Vacation Club. As the Sabal Palms' affiliated vacation club, you'll have unprecedented access to some of the club's best and most exclusive benefits, especially if you choose to upgrade your ownership. Upgrading to Marriott Vacation Club Destinations points, for example, can lead to better, more flexible vacation planning and reservations at Marriott Sabal Palms Orlando. What's more, you can use your points-based ownership to unlock special perks and even explore different vacation possibilities at other Marriott resorts. The Marriott Sabal Palms is affiliated with Interval International, one of the world's best timeshare exchange companies. With a separate Interval membership, you can deposit your Orlando accommodations into their exchange network and trade for stays at other resorts around the globe. 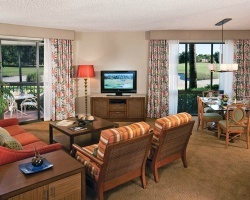 Additionally, Marriott's Sabal Palms is a Premier-rated resort with Interval. This means that when you exchange, you'll be able to trade your timeshare with resorts of similar quality and standards. Your stay at the Marriott Sabal Palms will be perfectly complimented by the resort's wide range of on-site amenities and services. Enjoy the resort's massive outdoor swimming pool, or head up to the full-service fitness center to stay on top of your exercise goals. Close by, you'll find a world of desirable attractions yours for the taking. Take advantage of the resort's free parking to easily travel to Walt Disney World, Universal Studios, and SeaWorld Orlando. Golfers will love exploring the great courses around Central Florida, like Orange Tree Golf Club and North Shore Golf Club. Your day trip potential is also unmatched, with sites like Busch Gardens and the Kennedy Space Center all within convenient driving distance. For alternative things to do and see, shop at the Mall at Millenia or head to an Orlando Magic or Orlando City SC game. Already Own at Marriott Sabal Palms?